Apple cider vinegar is something that most of us will be used to seeing on salads or perhaps a marinade, but this great, tart tasting vinegar has actually been used for its health properties for thousands of years. Used by both the ancient Greeks and Romans it was even said to have been used by Hippocrates the 'father of modern medicine.' ACV is made by fermenting apple juice to make an alcoholic cider. At this point, a strain of bacteria is added that turns the sugars found in the cider into vinegar. During this second fermentation process, the vinegar develops a cobweb like structure known as 'the mother,' said to be responsible for many of the healing properties associated with this tonic. Apple cider vinegar is brim full of vitamins and minerals as well as being a plentiful source of pectin and natural acids that give ACV antibacterial, anti-fungal and antiviral properties, all of which can be used to keep your rabbit healthy well into old age. 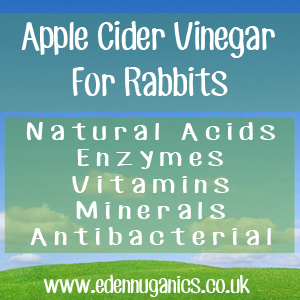 How does apple cider vinegar help rabbits? Just like humans, rabbits need trace minerals and vitamins to stay healthy. Apple cider vinegar contains pectin, vitamins B1, B2, and B6; biotin, folic acid, niacin, Pantothenic acid and vitamin C as well as trace minerals including: sodium, phosphorous, potassium, calcium, iron and magnesium. In addition, apple cider vinegar helps to keep your pet free from parasites and infections due to naturally occurring malic and acetic acid. However, be sure to only buy raw, unpasteurized vinegar, as cheaper, processed varieties will be lacking all these benefits. Feeding your rabbits ACV helps to prevent urinary tract problems. Apple cider vinegar helps to regulate pH levels, this also benefits skin infections and weepy eyes. Adding apple cider vinegar to your rabbit's diet can improve digestion and increase nutrient absorption levels throughout the G.I tract. It is thought that apple cider vinegar is able to booth boost fertility rates and reduce infant mortality in rabbits. Apple cider vinegar reduces parasites, including mites and fleas. A natural cure for mastitis, backed up by veterinary studies. Apple cider vinegar can also be used as a chemical free cleaner for cages and hutches. ACV is safe for rabbits of any age and even pregnant rabbits can benefit from the vitamins and minerals it offers. Adding ACV to water changes its pH level and is known to help animals suffering from arthritic conditions. Rabbits like the taste of ACV and drink more water, resulting in better hydrated rabbits.